For most people, one transformation is enough, but Samantha went through it twice. She used many aspects of Bodybuilding.com to become a bikini champion and a fitness educator! My story involves two transformations. In high school, I swam competitively, sang in choir, and participated in drama. In college, I competed in beauty/scholarship pageants. Since age 13, I knew I wasn't a thin girl. I wasn't overweight, but you could've described me as "thick and healthy." On top of my school activities, I regularly attended circuit training, Pilates, spin class, and dabbled in the weight room. After going hungry for many months to be at pageant weight and quickly gaining it back, I came to terms with my weight. I looked deep inside myself to find what I was good at and willing to work for. I was naturally muscular and enjoyed being strong, but I didn't want to maintain at the gym; I wanted a goal to be better and stronger. The summer before my junior year at Oklahoma State University, I browsed through Bodybuilding.com and fitness magazines. I turned to my friend one day and said "I'm going to start lifting weights and compete." I convinced my college roommate/best friend to attend the gym with me every night when it wasn't crowded and we taught ourselves to work out. Every night before we went, I browsed workouts on Bodybuilding.com and researched exercises I was unfamiliar with on the exercise database. After six months of lifting, in January 2011, I started cutting for the Mr. and Ms. OSU Bodybuilding and Figure Competition and the NANBF Southern States Classic in Liberty, Missouri. I taught myself how to "cut" and attended posing practices. 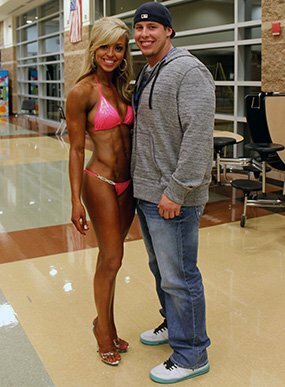 In April 2011, after working as a waitress, taking a full course load, and obtaining my ACE personal training certification, I won the overall title at OSU and placed in the top five for novice and fourth in beginner figure classes in Missouri. After the competition, I was approached by the 2010 overall figure champion. She asked who my trainer was, and I said "Bodybuilding.com." After all of my accomplishments, I made a rookie mistake and relapsed hard. I thought I deserved to indulge, but I took it entirely too far. I wasn't living with or in the same town as my lifting partner and didn't have any support. I worked two jobs, quit lifting, and ate poorly during the entire summer. I went back to school, got into the swing of things, and made another rookie mistake. I wanted to put on muscle mass and decided to eat a lot. In January 2012, I was approached by Brett Walden, who won the overall bodybuilding at OSU the same year I did. He proceeded to tell me his story and it sounded exactly like mine. It put my goals back into focus and encouraged me to start cutting for the NPC Oklahoma in June of 2012. By May, I lost 25 pounds, but didn't feel ready to step onstage. I decided to concentrate on summer school courses required for graduation instead and maintained my weight throughout summer. Brett again encouraged me to compete and was willing to help me through prep. I competed in bikini for the first time 12 weeks later at the OKC Grand Prix and won first place in my class to qualify for nationals. I went to nationals in Atlanta, Georgia, the next weekend with some friends who competed in men's physique and placed in the top half of my class with more than 45 girls. I set a goal, didn't to lose sight of it, and taught myself everything, which I believe is an important aspect of my success. I have a great understanding of what goes into the sport. I was once told that no one is self-made, and that statement holds true. Brett turned out to be a great coach, lifting partner, and best friend, but after a few weeks, he turned into an amazing boyfriend. Brett told me to keep fighting during mornings on the stair stepper and nights in the gym when I didn't want to be there. My parents and roommates were wonderful for putting up with and supporting me the whole way. Everyone needs a support system. It's the most important thing you can have. I eat every two hours and drink as much water as I can. I kept my workouts between 60-90 minutes and the number of sets low so I didn't over-train. I did cardio 4-6 times per week for 45-90 minutes at moderate intensity and increased the duration of my cardio as I got closer to the show date. The diet was the most challenging at first, but after a while it was hard to find time to do everything. I developed better time management skills to balance my busy schedule. I plan to take the next two years during physical therapy school to add size and improve my physique. Then I plan to compete in an NPC competition in the figure division and earn my IFBB figure pro card. As a physical therapist, I want to promote the sport and help people overall. Ask questions and educate yourself as much as possible. When it gets tough, keep going. Wake up every morning and remind yourself of your goals and why you started. Bodybuilding.com helped me order the supplements that got me through my transformation and provided the exercise database so I could learn new exercises the right way. I tell clients and friends to watch exercises on the database so they correctly perform the exercise without risking injury. The articles on supplements, nutrition, and exercise made me a better trainer and bikini and figure competitor.